I am gonna work on my Singapore posts in between other posts because I can't wait to share with you the new and exciting things I experienced during my 8-day stay in this beautiful country. To be honest, it was a spur of the moment thing. I had no plans of flying to Singapore but a fortunate stroke of serendipity came my way. I think the music gods may have heard my pleas and saw my desperation because I was suddenly able to buy a ticket for the COLDPLAY concert in SG! What happened was, I've been scouring the net for a concert ticket anywhere in Asia for MONTHS. I will do anything and go anywhere even if I had to watch solo just to see my favorite band and be part of my dream concert. Then one day, Anagon asked me if I'm still looking for a ticket since a friend of her sister couldn't make it and is selling hers for almost the same cost. Walang ng isip isip, I said yes agad!!! I cried tears of joy, guys. Huhu. So fast forward to March 28, the day of my departure to Singapore. I was ecstatic because I was on my way to watch my favorite band AND I will be touring around one of my favorite countries-- again! Last time I was there was 2015 with my whole family. My Dad was still fit for travel then, so it was pretty special. Ana and Tracy flew ahead of me (Tracy on the 23rd and Ana on the 26th) so we just met up when I got there. Here are stories and photos from my 1st & 2nd day in Singapore starting with my outfit photos! My reliable World Traveller luggage! Was able to pack 8 days worth of outfits and essentials inside for almost 10kg only! Wrangler travel bag & Something Personal by Nica personalized passport holder! Used my GetGo points to buy my ticket and just paid P6,000 even if I booked a week before my flight. Hihi. Also brought my favorite JUMPU powerbanks! Love that it has attached cords for iPhone and android. Was surprised when I stepped inside the plane! It was HUGE! Up to seat number 60+. Pang US. Hehe. After 3 1/2 hours, finally in SINGAPORE! First agenda? Get my luggage and find an ATM machine! Withdrew money using my BPI card! Take note that you have to request card activation for international withdrawals. You have the option to activate it only for a few days or forever. I chose forever. Haha. But make it a habit to check your account online after every transaction to make sure no hocus pocus happens. There's a charge of P150 - P200 per withdrawal. I opted for atm withdrawal than Forex because rates are better. I also needed money for food and commute. Upon exiting, saw this food stall and chose to eat super late dinner here. So a few days before leaving Manila, I was emailing with Jeslyn of BUNC Hostel and she gave me instructions on how to go to the hostel from the airport. I had 3 options: train, cab or shuttle. I arrived after midnight so the train was a no-go (they only operate til 12am) and I didn't want to ride a taxi/Uber/Grab because it was too expensive. I decided to try out the 24-hour shuttle service. The concierge was pretty easy to find because it's near the exit and there's a huge sign. You wouldn't miss it. Sample! Use any of the payment methods on the screen. Only paid $9 for a shuttle service from the airport to my hostel! There were still a lot of guests making tambay downstairs at this time. Everyone was friendly. Free maps and brochures for tourists! 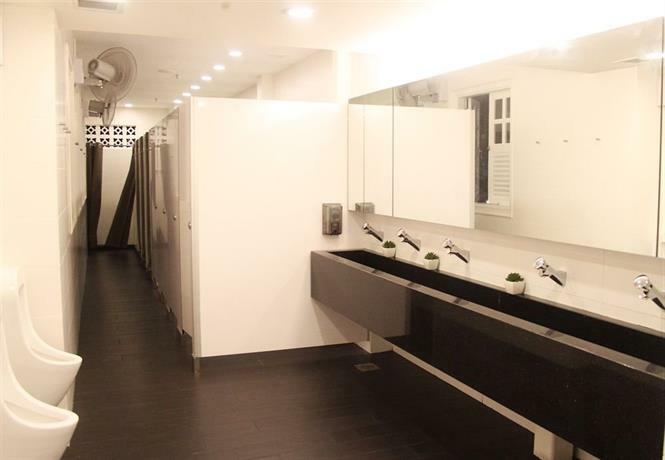 I love how well-maintained and clean their bathrooms are. I left a few toiletries on the counter (just what I do in other hostels so I won't have to keep bringing it) but the next day they were gone! I think the cleaning lady or gent thought it was trash and threw it away. Huhu. Tracy said it might be because they really keep the bathrooms clean. If you have no idea where to go in Singapore, then check out their walls for guides! From our room (which I'm gonna show you later on), there's a staircase leading to the Common Area at the 2nd floor. There's a mini garden, laundry area, movie area, tambay area and cooking area! No clothes, no prob! Labadami, Labango! There's a microwave, water dispenser, stove where guests could cook. This area is used for socials and movie screenings! So cool. Now, check out our room! Sorry for our mess! Haha! P.S. They are providing a special discount for you, my readers!!! :) You can get a 10% discount if you book directly with them. Just use my promo code "AI10" and email it to info@bunchostel.com to book your stay. This code is valid before November 2017. For news, updates or to book a bed/room, follow BUNC!